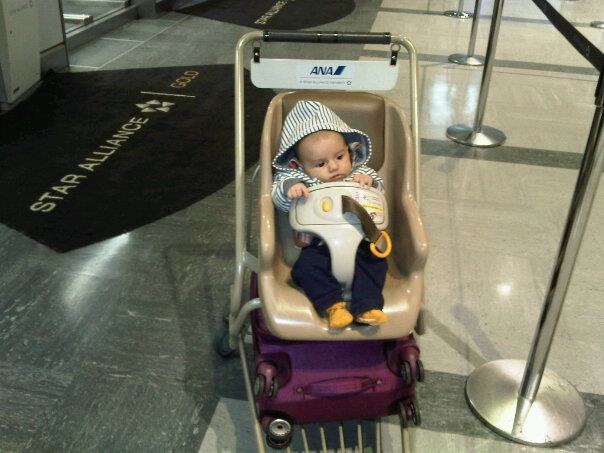 Finally, part two of the naked truth of traveling with an infant and a toddler. We’ve already discussed some of the horrors challenges that traveling with a little one and an even littler one entail. Now, it’s time to face the giants, pack up your suitcases and enjoy the ride. 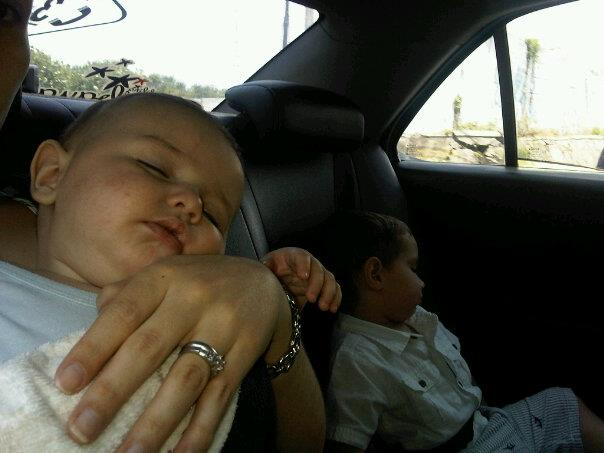 Here are some tips that have made our travel with the two boys easier and more enjoyable. Avert the 5-minute crises that involve an infant throwing up and a toddler jumping off the bed and cracking his head open. Make sure you burp them, change their diapers regularly and don’t forget to feed them. If one of the kids needs your undivided attention (e.g. diaper changing, feeding or bath time), make sure the other one is calm, busy and in a safe place. You know your children the best so know which one genuinely needs you if they are all crying bloody murder and tend to his/her needs first. Evan loves pretending something is wrong as soon as I start holding Joshua so I have learned to read him and I now know when he urgently needs me. Try to do most of the tasks with all your kids. Prepare a collective bath for all the little ones. Feed the infant and challenge the toddler to feed him/herself at the same time. Try to encourage them to nap at the same time. You will enjoy the break, even if it’s just 5 minutes long. As I mentioned before, the toddler can be your biggest ally and helper. Make sure you tell him he’s doing great every time you catch him doing a good deed and never forget to tell him how proud you are of him for being such a good big brother or sister. Evan started doing so many things by himself when we traveled with him and Joshua. Suddenly, he started dressing himself and putting his shoes on. He didn’t want me to feed him anymore and even learned the hotel floor we were staying in. You are no longer on a schedule. For the toddler this is an exciting new place and the last thing he cares about is eating, sleeping or relaxing. For the baby, this is new and unknown territory and it might sometimes be overwhelming or even scary. Learn to be flexible with your travel plans and routine. If you don’t allow them to watch TV at home, don’t panic if they suddenly end up watching Disney Channel for a few minutes. Follow their cues and try to relax. 5.I f everything else fails, go to the bathroom and take a shower, you know you need it! If not a shower, at least a break. Nobody said it was easy, but it is totally worth it. You won’t remember the time the infant threw up in the taxi or the toddler ran into the elevator by himself. You will remember the smiles in their faces and the amazing bonding time you got to spend with them. It depends on the length of the trip, the weather in your destination and how messy you know your kids are. Small drying rack, bottle brush and dish soap (I know, annoying to carry, but I’ve tried drying bottles on a towel and it just doesn’t work). Their favorite toys. One or two small ones for each. I know this seems like a lot but by the time you are about to leave, the volume of the diapers has decreased and you wont’ have trouble getting home. I also found this guide on the What to Expect website and I think it’s very accurate. Also, stay tuned for a guide to our favorite travel gear. Let the children be known as Evan and Joshua, not the crying infant and the jumping toddler. Establish a relationship and let them be seen as a cute companion and not as an annoyance. Let them know they are good kids and they usually behave .Most people like kids so don’t stress out too much. Especially if you are flying on a trans-Atlantic or trans-Pacific flight, buy a few new cheap toys and start handing them out progressively. Bring toys you don’t mind loosing and maybe one or two of their all-time favorites, make sure you don’t loose those. If your toddler is like my Evan he won’t mind playing with an Ipad or Iphone all day. Make sure you load some new apps before you get on the plane and don’t forget to download a few new episodes of their favorite show. Look for the kid channel on the Airplane entertainment system and let them watch the Cars 2 movie 5 times if comes down to that. 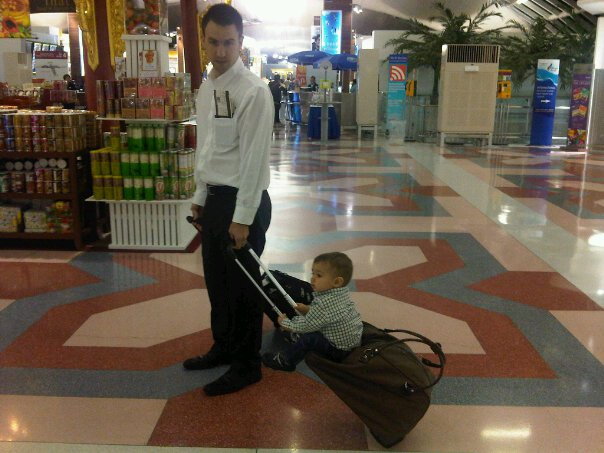 Especially if you are on a long-haul flight, let your kids go for a walk. It is soothing and entertaining for them and hopefully will make them tired enough for them to crash once you go back to your seat. Walking is great for adults too, so now you have an excuse to walk around and take your baby for a promenade. This is a hard one. But sometimes you just have to give-in. Anyone who offers to help does so with good intentions so just be brave enough to let them give you a hand. Maybe you need to use the bathroom, let the flight attendant watch over one or both of the kids if they are sleeping. 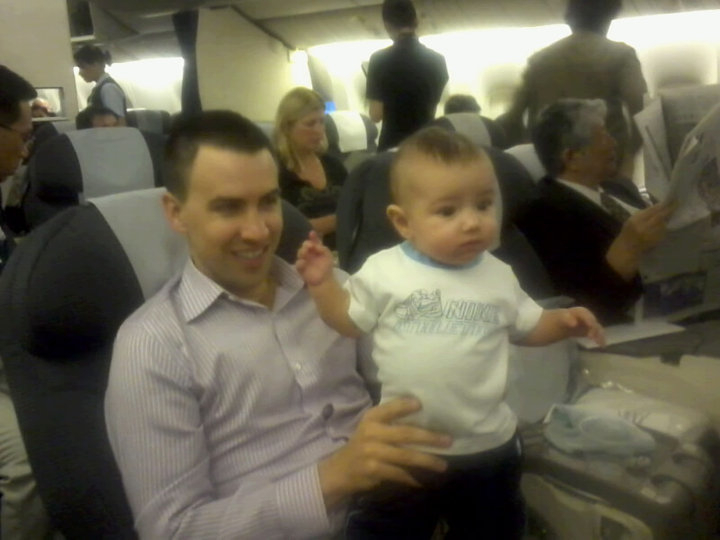 If the flight attendants offer to hold your baby, accept their help. This usually doesn’t happen in the US, but in Asia they love to hold babies and parade them around. The baby will love the attention and you will appreciate the break. Bring chocolates or other nice treats for the passengers around you. This is a nice ice-breaker and will at least change their attitude towards the lady with the pack of wolves kids. Explore the hotel and “discover” a different floor each time. Go on scavenger hunts and try to look for random things. Check out the pool area, the restaurants, the lobby. Make a big deal out of the “awesome fountain” and the “lovely painting on the wall”. They will keep an eye on your kids if they ever decide to go in the elevators by themselves, (like Evan often does) and show you to the table closest to the food at breakfast. Be nice to them, tip them when appropriate and let them help you when they offer to. If you need two cribs, more towels, more bottled water, etc. ask for it. Let the housekeeping staff know that you would appreciate if they clean the room as soon as you go out as you might have to come back soon after if the kids are cranky and need a nap. If you need for them to come and pick up the trash, just call them. It will make your stay much more pleasant. Make sure you are able the formula you need at your vacation spot, otherwise bring enough with you. See what products are available such as diapers, formula, cereal and wait to buy them locally if you think the quality is acceptable. If your little one is already eating solids and you don’t like feeding Gerber to your children, don’t stress out and stick to bananas and other things that don’t have to be steamed. I like to give natural purees to Josh so I just give him bananas and if a restaurant seems reliable enough I will ask for steamed carrots that I can mash-up myself. Feed him when he asks to be fed, even if it’s not when you are eating. Trust me, feeding them at weird hours is better than dealing with a cranky hungry toddler. If eating at a hotel, get him his food first. Let him start eating and then go get yours. Remember he’s no longer on a routine so feeding time is much harder. 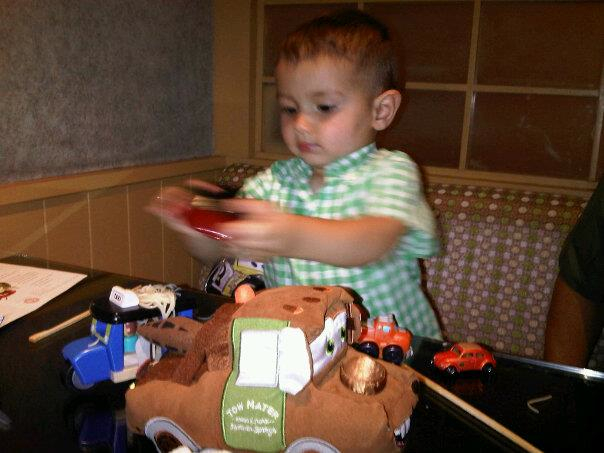 Bring toys to the table to keep him entertained and keep him from running away from the table. If all your toddler wants to eat is rice, it’s ok. Let him have rice for breakfast lunch and dinner. As long as he’s eating healthy let him eat what he wants, whenever he wants. Worry about getting back on a schedule when you get home. Tell him you will go to see that “big boat” or the lions at the zoo if the takes 5 more bites. Whatever works! Don’t get stressed out, they will eat when they are hungry. This is just what has worked for us. Every kid is different and any every place you visit will come with different circumstances. The biggest advice is to enjoy and savour every moment! Click here to see Part I of Traveling with a Toddler and an Infant: The Good, the Bad and the Ugly! 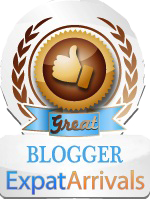 You need to add an RSS feed link so we can subscribe in Google Reader! !